Henry Sterling Creamer (June 21, 1879 – October 14, 1930) was a Black American popular song lyricist. He was born in Richmond, Virginia and died in New York. He co-wrote many popular songs in the years from 1900 to 1929, often collaborating with Turner Layton, with whom he also appeared in vaudeville. Henry Creamer was a singer, dancer, songwriter and stage producer/director. He first performed on the vaudeville circuit in the U.S. and in Europe as a duo with pianist Turner Layton, with whom he also co-wrote songs. Two of their most enduring songs, for which Creamer wrote the lyrics, are "After You've Gone" (1918), which was popularized by Sophie Tucker, and "Way Down Yonder in New Orleans" (1922), which was included in the soundtrack for one of the dance numbers in the Fred Astaire / Ginger Rogers 1939 movie The Story of Vernon and Irene Castle. Success on Broadway arrived in 1922 when Creamer’s Creole Production Company produced the show Strut Miss Lizzie, and in 1923 to seal their success, Bessie Smith recorded their song "Whoa, Tillie, Take Your Time". Creamer's other Broadway stage scores include Three Showers. 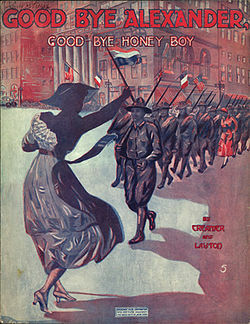 Creamer and Layton disbanded as a duo in 1924, when Layton relocated to Europe. He moved on to collaborate with other notable composers including J.C. Johnson, Jimmy Johnson, and vaudevillian Bert Williams. In 1924, Creamer joined ASCAP. In the fall of 1926, Creamer was commissioned to direct the Cotton Club revue, The Creole Cocktail. The show featured Lottie Gee, Loncia Williams. Henry and LaPearl, Louie Parker, White and Sherman, Eddie Burke, Ruby Mason and Albertine Pickens. Also in 1926, Creamer and James P. Johnson wrote "Alabama Stomp". In 1930 they achieved another hit with "If I Could Be with You", which was recorded by Ruth Etting. The song also became the theme song for McKinney’s Cotton Pickers and was also a hit for Louis Armstrong (Okeh 41448). Creamer was a co-founder with James Reese Europe of the Clef Club, an important early organization for African-American musicians and entertainers in New York City. He died on October 14, 1930 at Mount Sinai Hospital (Manhattan) and was buried in Woodlawn Cemetery (Bronx, New York). ^ "Henry Creamer- Bio, Albums, Pictures – Naxos Classical Music". Naxos.com. 2011-06-25. Retrieved 2015-12-25. ^ "Henry Creamer & Turner Layton". Jass.com. 1930-10-14. Retrieved 2015-12-25. ^ "Henry Creamer | IBDB: The official source for Broadway Information". IBDb.com. Retrieved 2015-12-25. ^ "Henry Creamer : Biography". IMDb.com. Retrieved 2015-12-25. ^ a b "Henry Creamer | Biography & History | AllMusic". AllMusic. Retrieved 2017-06-19. ^ "Henry Creamer". IMDb. Retrieved 2017-06-19. ^ "The Pittsburgh Courier from Pittsburgh, Pennsylvania · Page 10". Newspapers.com. 1926-11-20. Retrieved 2015-12-25. ^ "Louis Armstrong and his Sebastian New Cotton Club Orchestra". Redhotjazz.com. Retrieved 2015-12-25. ^ "Theatrical Colony Mourns Death of Three Members" (PDF). The New York Age. 1930-10-25. p. 6. Retrieved 2017-08-11. This page was last edited on 22 September 2018, at 11:12 (UTC).